Dr. Martha Clare Morris and colleagues from Rush University in Chicago and the Tufts Human Nutrition Research Center in Boston followed 960 older adults enrolled in the Rush Memory and Aging Project. The research team focused on the level of consumption of green leafy vegetables, like spinach, kale, collards, and lettuce, which have been suggested in previous research to have protective factors against cognitive decline (Kang et al., 2005; Morris et al., 2006), and looked at the association with performance on cognitive tests. The average age of the participants was 81 years and all were dementia-free at the beginning of the study. Over an average of nearly 5 years, participants underwent an annual battery of tests that assessed cognition in five domains (episodic memory, working memory, semantic memory, visuospatial ability, and perceptual speed). Data from food frequency questionnaires administered at the beginning of the study were used to assess how frequently people ate some 144 items over the previous 12 months. Dietary intake levels of the nutrients of interest were estimated from responses to all food items. The three green leafy vegetable items and their serving sizes included in the questionnaire were: spinach (1/2 cup cooked), kale/collards/greens (1/2 cup cooked), and lettuce salad (1 cup raw). Additional diet, health, and demographic information was collected during annual visits. In the study, consumption of green leafy vegetables was positively and signiﬁcantly associated with slower cognitive decline. When comparing the highest daily consumption (median 1.3 servings a day) with the lowest (median 0.09 servings a day), the rate of cognitive decline among those who consumed the most to those who consumed the least was equivalent to being 11 years younger cognitively, based on average global cognitive scores over time. There was no evidence that the association was affected by cardiovascular conditions, depressive symptoms, low weight, or obesity. 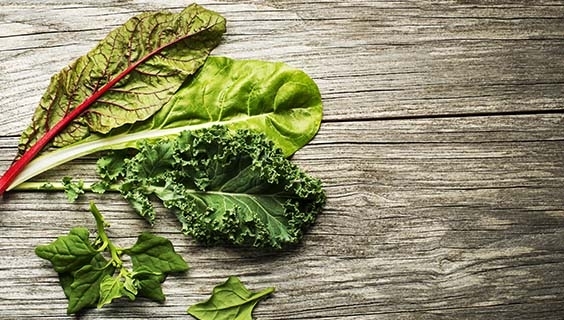 The researchers also examined the relationship between cognitive change and nutrients for which green leafy vegetables are a rich source (folate, phylloquinone, nitrate, α-tocopherol, kaempferol, and lutein). Intake of these nutrients were each individually positively and signiﬁcantly associated with slower rates of cognitive decline and were not due to other underlying health issues. Further investigation indicated that phylloquinone, lutein and folate likely were the source of the effect seen on cognitive decline. This study indicates that consumption of green leafy vegetables is associated with a slower rate of cognitive decline in older adults, possibly due to the neuroprotective actions of specific nutrients. As research continues, the researchers suggest that adding a daily serving of green leafy vegetables to one’s diet may contribute to brain health. Morris MC, et al. Nutrients and bioactives in green leafy vegetables and cognitive decline. Neurology. 2017 90:e214-e222. Research supported by NIA grants R01 AG031553 and R01 AG17917. Kang JH, et al. Fruit and vegetable consumption and cognitive decline in aging women. Annals Neurology. 2005 57:713–720. Morris MC, et al. Associations of vegetable and fruit consumption with age-related cognitive change. Neurology. 2006 67:1370–1376.